Canelo Alvarez knocked out Amir Khan in 6th round to retain WBC middleweight title on Saturday night. 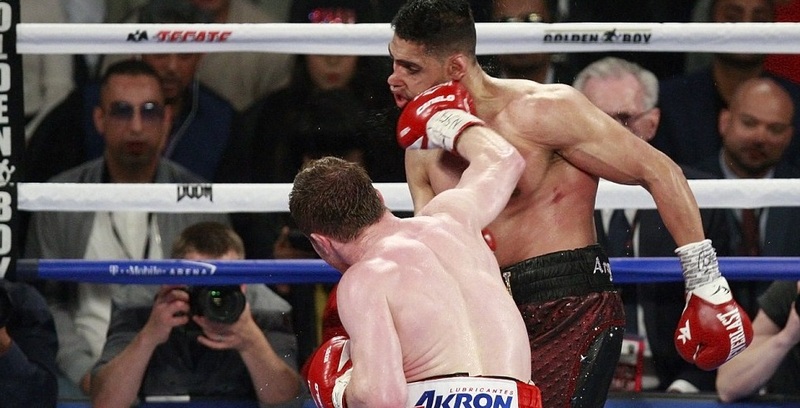 Amir Khan predictably started stronger but got caught cold once Canelo started finding his range. Khan was hit by a lethal right which ended his night abruptly after such a good start to the fight. Khan won the first three rounds pretty easy and looked comfortable out-boxing Canelo but as soon as Canelo got into rhythm in the fight it was just a matter of time when he catch Khan with a big punch. Thats exactly what happended in round 6 when Amir threw a combination but Canelo countered with a big right and that pretty much end the night for Khan. Khan has a long way back after this terrible defeat. However he will be pocketing a good $10 million from his nights work but his reputation has taken a serious dent . 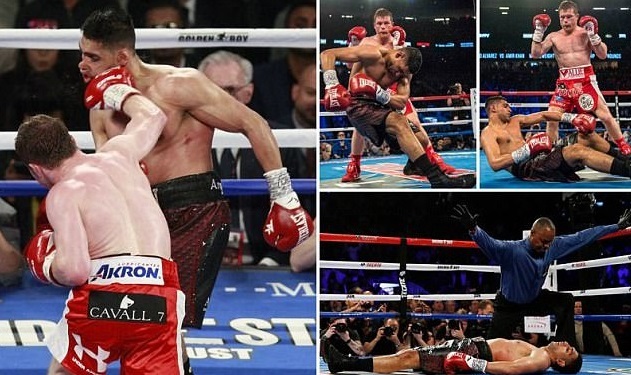 Khan started with some nice movement and combinations in the opening three rounds and he was ahead on scorecard after first three round but by round 4 Canelo started to gain momentum and he caught Khan in round 5 and from than on it was just the matter of when Canelo will connect his power bomb. It was a big big shot and Amir Khan felt it every bit of it. There were some alarms as Khan failed to respond to Kenny Bayless count and medics were rushed to the scene. But after some carefull examin he was on his feet and talking, thanking the traveling UK support and eager to return to ring but at 147lbs. Canelo Alvarez will defend his WBC middleweight crown against Amir Khan on Saturday night, 07 May 2016 in Las Vegas what will be the mainevent of HBO’s pay per view in United States. Its a massive fight for both fighters careers specially Amir Khan who can put his name right up there with the biggest stars in boxing with a win against highly rated middleweight champions Canelo Alvarez. Nobody is giving Khan a chance against Canelo and bookies have installed Canelo as outright favourite for the fight and rightly so looking at both fighters careers and natural weight. Fight will take place at the around midnight eastern time (US) and early hours of Sunday morning of UK. 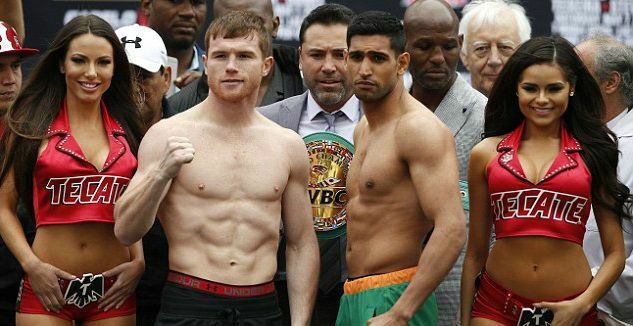 Amir Khan looked in great shape in the weigh-ins on friday night and although there is no clause for dehydration and we can expect Canelo to come in 10 to 15 pounds heavier having kill the required weight of 155lbs in friday’s official weighins. Khan and his camp has been vocal about their chances in the fight but there are hardly any boxing experts who are giving him a chance against mexican hotshot Canelo who should be fighting Gennady Golovkin instead of fighting someone who is jumping not one but two weight classes and there is not much to gain for Canelo in fighting Amir Khan but everything to lose. Khan’s only chance against Canelo is by beating him fighting on the outside and using his slightly superior boxing skills combine with electric speed (if he can retain some after putting on extra weight). Canelo Alvarez on the other hand is good enough to catch Khan at some point in the fight with a power shot and that will be the moment where fight might be decided. The fight will be at a catch-weight limit of 155lbs and many boxing experts don’t believe a middleweight fight should take place at this weight as a proper middleweight fight should have atleast 160lbs limit. Canelo Alvarez looked confident and promised a superb night to his mexican fans but he did looked dry and it was evident he struggled making the weight. 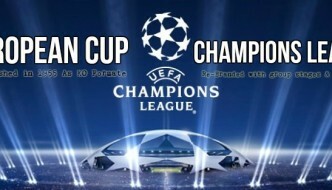 Now, that would be a total battle.